There are several stages of developing a Laravel application. For most small startups up to medium sized projects, the process isn’t as monitored and maintained by many people as it is with big, enterprise applications. It’s also easier to deploy smaller Laravel projects faster and for this usually, a framework is used as it abstracts most of the work that needs to be done. Laravel is one of the most used PHP frameworks and makes Rapid Application Development (RAD) easier. There is a significant difference between the development and production environments and we’ll cover the main process of deploying and installing a Laravel application to server. There are other factors to be considered when building software such as continuous integration and making sure there’s enough room for growth when new features need to be implemented and that their implementation will be easy, leaving the code in good, maintainable condition. Generally, the development flow of Laravel projects starts with the design of all interfaces that will be implemented. Developers ask what business problem will the application solve and see how Laravel features and options can meet the client’s requirements and expectations. After the team agrees on the interfaces they move on to the database structure. Once ready with both the team can go ahead and start the implementation. Normally this involves either a Laravel installation to a server or installing Laravel locally. Installing Laravel is different when working in a team compared to developing it on your own. All members of the team need to work with the same version and in an equal environment, close to the live one that the Laravel project will be deployed in. Before installing Laravel you need to make sure that your machine and the software on it cover the framework’s requirements. After that there are several ways to proceed, using Composer or it’s PHP installer. After installing Laravel a .env file will be generated. All settings for your local environment need to be reflected in there. Now that Laravel has been installed the team is ready to start working on implementing all interfaces, simultaneously they also work with the SQL structure. On different occasions or milestones, the application is handed over to Quality Assurance engineers that run extensive tests to prevent bugs. A big difference between well-written software and poorly written one is planning ahead of time, so when the time for updates or new implementations come – it will be done with minimal efforts. Once ready for a production version that meets the client’s requirements the code is ready to be pushed into production. A DevOps engineer is usually tasked with this but for smaller projects, an experienced team member could also do it. In the practice that we have seen the most used tool for this is Git and there are some tools that could be used for Continuous Integration occasionally. – Difference between how the application will handle and respond to both HTTP and HTTPS requests. This also involves cookies and there are ways to simulate a valid SSL certificate for a local domain. – Error displaying is usually turned on in a development environment and it is a common practice to be disabled when in production. Showing errors and crucial information about the application when working on its development is necessary but after it’s been deployed it’s not okay to expose personal information about any clients or members nor anything that might reveal information about the website structure itself. – Testing the behaviour of the application for more than just one user. When developing locally only one developer is accessing the website at a time and the scalability of the project needs to be tested. There are many ways that this is done and one of them is using 3 different databases – one empty, one with medium data in it and a very large one. – Caching content plays a big role in speeding up an application. It’s not desired to be around when developing the project and there aren’t always easy ways to stop it. Some simple workarounds involve using functions for displaying current time which will always yield a slightly different response to each request. 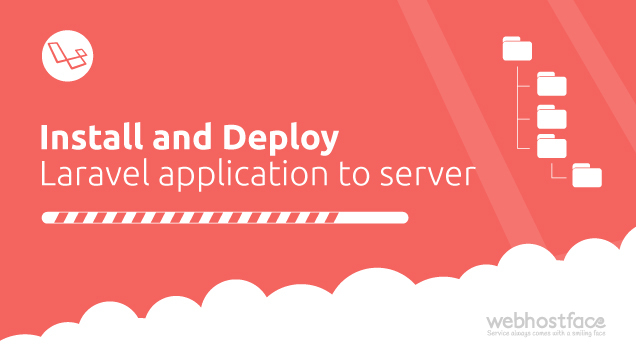 This covers a basic development process of a Laravel application – the process of installing and deploying the Laravel application into a live environment on a web hosting server. You can benefit from a fast and reliable SSD Laravel Hosting with our shared hosting services. Now with a greatly discounted price! Start your new Laravel Application, Install Laravel or Deploy Laravel project without investing a large amount of money and grow your online presence! And we can help you start and grow your site! Can you create a small tutorial on the steps under “Deploying Laravel Application”? There are simple and quick steps for deploying your application listed at the end of the article. If you are interested in a more detailed guide on any of the steps, please let us know and we will be happy to give more information! ich wäre sehr interessiert an den detaillierteren Ausführung!